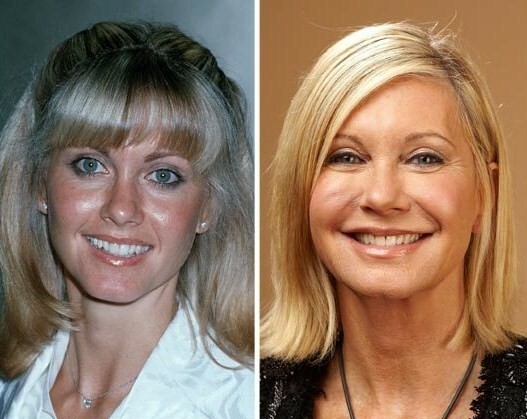 Olivia Newton-John before and after plastic surgery. 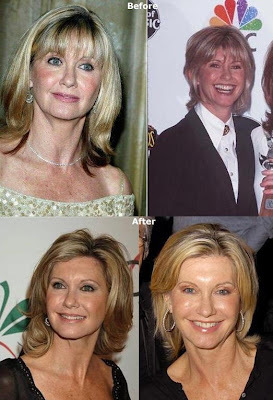 Olivia Newton-John is a sensationally successful English born Grammy award winning singer and actress, who has achieved five number one singles and fourteen certified gold albums, however she is known by many for her role opposite John Travolta, in the wildly popular film, Grease. Once upon a time back in 2005, Ms. Newton-John was quoted as saying: "I haven’t had plastic surgery yet, though I would never say never. However, I would like to think that I won't because the thought of it is an uncomfortable one. I think I'm just fortunate, genetically, and I've always said that I want to age gracefully like my mum did." However the mere thought of plastic surgery, must have triggered something for Olivia, considering the singers facial appears has taken on a new image, over the course of the previous five years. The before and after photos above, showcase the the singers inevitable signs of aging, with sagging and thinning skin, which ultimately transformed into an extra tight, tucked and supple looking result, perhaps due to procedures such as a facelift, eyelid surgery (blepharoplasty), along with facial fillers like Restylane and Juvederm to smooth away deep wrinkles, and botox injections to tighten things up a bit. As you may know, whenever a patient starts dabbling in facelift nips and tucks, there is always a chance for that scary subhuman result, however in the case of Olivia Newton-John, she doesn't appear quite as "shocking" as we've seen with previous celebrity plastic surgery victims... Perhaps a diamond in the rough? Where the hell did her beautiful big eyes go?? WHY???? Just saw her on Bio; her neck and chest give away what the rest of the Real Female World knows: you can't find a better Male World than that you attract of Those Who Really Care, not your manager who makes money off of you. The shame is that The Women Who are Responsible for this male-dominated/promoted world who support these bastards that work for Barbie when it is Joan of Ark they want for their offspring, Muslim and Others. Make a difference or suffer the AfterLife consequences. It is really too bad that the beautiful Olivia felt she had to go to this extreme to try and look younger. We must all decide to grow older gracefully and Olivia still looked beautiful in her 60's. Kenny Rogers is a prime example of vanity and now Olivia has followed in these steps.